If you manage multiple markets or a combination of markets and vendors, you know how much extra effort it can be. Farmspread Organizations helps you by consolidating all of your various market info into one place. With one log-in, you can take care of all of your market management. In today's Feature Friday, we will walk you through how to create an organization, and how it will benefit you as a market manager. We are assuming in this walk through, that you have already created and/or claimed your markets in Farmspread. If not, and you need help, you can watch some walk-through videos here to get started. Next you will need to create a Farmspread Organization. Select Your Organizations from the top navigation bar of your user settings. Then click the Create an Organization button. 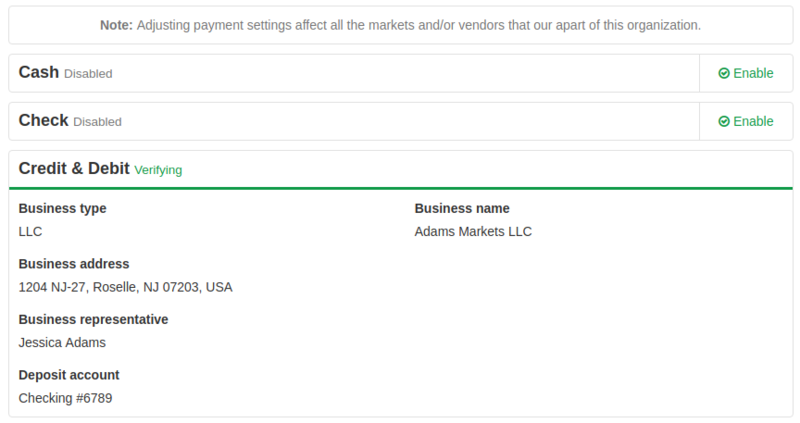 Name your organization, in this example we will call it Adams Markets LLC. Click the Create button. Now that you have a new Organization you can add a logo. Click on the Organization Overview button to the right of the organization listing. Then click settings and the edit pencil icon to the right of the Logo section. Select and upload your logo. Now lets add your markets to the organization. Select Dashboard from your navigation bar and then click the Add a Market button. In this example we already have two pre-existing markets, select Move existing market and then choose one of your markets from the dropdown. Now lets add our second market. Click the Add another market link at the top right of the Markets listing. This will bring you to the market selection window, select your second market and click Add. Now both markets have been added to your organization. To make life easier, we want to consolidate both markets to use the same bank account for vendor payments. Select Payment methods from the Payments section of your organization dashboard. Then enter all the required bank account information as required by our credit card payment processor. This is a secure form, and none of the information is stored on Farmspread servers. We follow all DSS PCI compliance standards. In this case we are going to add Credit & Debit as a payment method. That way both of our markets can accept credit cards as online payment for vendor fees. By accepting credit cards online you will be subject to a standard processing fee of 2.9% + .30 cents per transaction. This is a fee collected by the payment processor and not Farmspread. We do not add any additional fees for the convinence of using credit cards. After you fill in the secure form your account will be updated to reflect your new payment type. Now you can start accepting credit cards from both markets with a centralized view of all payments. Farmspread Organizations also allows you to have multiple user accounts assigned to your markets. That way, you can delegate management of your markets to others. In this example, Jessica Adams has an employee who helps her manage one of her markets. This employee should first register as a user on Farmspread. To add the second user account, email info@farmspread.com with the organization name and the additional account name(s). If you would like email notifications, including farmspread messenger messages, from each market routed only to specific users, include that information as well. Above you can see the additional account has been added as a manager. Farmspread Organizations help you consolidate and streamline your market management. This means less time organizing and more time working on growing your market, increasing sales, creating a community and enjoying your local food!